The bill passed the second of three readings late last night with 50 senators voting in favour and 33 against, according to the transcript of the proceedings in Ottawa. It will now be reviewed by the Standing Senate Committee on National Security and Defence, known internally as SECD. Plett, who is on the SECD committee for the opposition Conservative Party, said the bill provides “false comfort” to people who dislike guns and “fails miserably” to improve public safety. 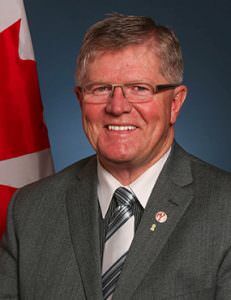 He criticized the Liberals for pretending Bill C-71 responds to rising crime, even though many of its elements were pitched during the 2015 election campaign as crime rates sank to their lowest levels in decades. A public-relations firm that advises the government has said new restrictions on federally licensed gun owners present an “untapped opportunity” for Trudeau and the Liberals to win votes in next year’s election. The Senate began debating Bill C-71 in September and could pass it this winter, Senator André Pratte, the bill’s sponsor in the upper chamber of parliament, told CTV News last week. Pratte, who has asked his colleagues to consider all sides on the bill, joined other supporters of the planned law in questioning Plett last night. Most senators who have taken the floor have spoken in favour of the proposed legislation. Bill C-71 would prohibit and eventually confiscate rifles from as many as 15,000 lawful owners and require hunters, farmers and sport shooters to get new police permissions to buy, sell or transport firearms. It would also make it harder for honest shooters to get and keep a gun licence. In addition to Bill C-71, Trudeau is considering a “full ban” on handguns owned by recreational shooters and competitors, marking all firearms in a way that links them to their owners and phasing out lead in ammunition. “This utter bureaucratic mendacity is just one more way to target those who don’t need to be targeted, for some have come to believe that guns are bad even in the hands of good and decent people,” David Richards, a non-affiliated senator on the National Security and Defence committee, told the Senate in reference to Bill C-71. Show support for Senators Plett and Richards on Twitter and Facebook. Join at least one national gun-rights association or provincial hunting association that is working to defeat Bill C-71. 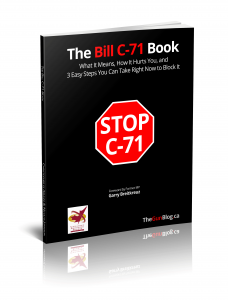 Buy The Bill C-71 Book, co-written by the editor of TheGunBlog.ca and referenced by Plett and other senators. You help TheGunBlog.ca if you buy from the link because we get a share of the revenue plus a small commission. You can also download the book as a free PDF. Support TheGunBlog.ca directly if you like what we do.